Wallpaper has made a strong comeback, and I have to admit I’m falling for it. 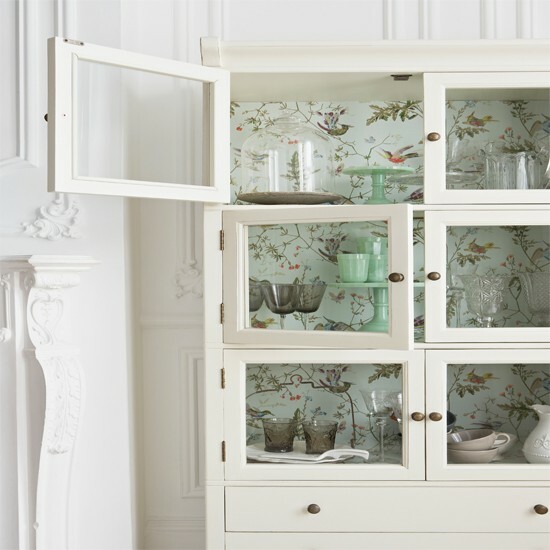 I love the look of wallpapered walls, cabinets, dressers, doors, etc. but the commitment of wallpaper still scares me. Our first home was covered in 100 years worth of layers (upon layers) of wallpaper that I personally had to strip. I NEVER want to go through that again! If you want the look of wallpaper, without the fuss of stenciling, or the permanency of pasted paper, then check out this fantastic tutorial by How About Orange! She demonstrates how to use cornstarch paste to hang fabric (preferably bed sheets or other thin fabric) to create “fabric wallpaper” that adheres well but is removable. I have a sad dresser in my master closet and I think it would be fun to use this technique and create something crazy like this! How about you? Have you embraced wallpaper again? This is so funny. Back in the early 70’s I did a whole bathroom in fabric on the wall and I did a valance over the sink, shower curtain and covered a hamper all with sheets. Except instead of “paste” I stapled it to the wall in places on the fabric that wouldn’t show. I only did one wall so it wasn’t too overwhelming. It was a flower pattern and did I ever get the compliments. It made such a statement. How I wish I had saved those sheets. They would be “vintage” now. Although I just did the beadboard paper in a little hallway leading to our downstais, (Martha’s) so easy to use, I must say.. I have embraced it and hung it up in the dining room. Grass cloth no less! I’ve wanted to try the fabric on walls, that would be fun. 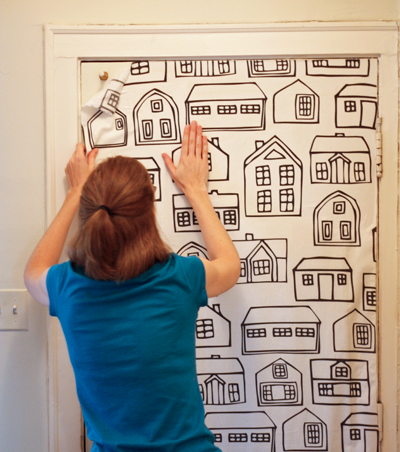 There are lots of amazing things you can do with wallpaper. I’ve taken a bit off plaster, it’s not terrible, except where there are lots of layers, like others have mentioned. Keep it wet, wait, scrape and repeat! But I mst say…I LOVE all the new patterns in wall paper right now and want to try some in my new home (just 1 yr away)! I have done the fabric wall treatment in several of my homes. Being an interior designer and military wife, I have to come up with easy to remove ideas since we move so often. Most people couldn’t believe it was fabric on my walls. I always find remnants and if it is too little then I “frame it out”. This also works great for the back of bookcases. I’ve done this for clients too and they love it! If you have not done this project before…you should try it! I couldn’t do it, but I love the idea of using fabric that can be easily changed out. Wallpaper is way too big of a commitment! Hi Beth! I just started a make over for a friend and since she lives in a rental I did a whole accent wall in fabric in order to get some color on her walls. I actually tried to link up to your party, but was too late. I loved the way it turned out…I also placed an old dresser (I found on Craigslist for $20!?!) that I painted green along the wall. I’m really loving the color combo and now I’m trying to find a way to get those colors in my own home! 😉 If you’d like to check it out, you can see it on my blog…I just posted it on the 22nd! Layers upon layers of wallpaper? How did you lice to tell about it?!? I really wish I would have saved a scrap of each layer. There must have been at least 8 different layers going back to 1915! Shudder. It was not a fun time. I would never do wallpaper. Not after scraping it off of plaster for 5 hrs!!! I have heard of this before, in respect to apartment living, becuase it is removable. Still couldn’t do this to my walls, but maybe to a dresser, or bookcase. Oh my goodness, 5 yrs?? I would never even want to see wallpaper after that. You poor dear! LOL. That’s actually what this post is about! Using starch with fabric to make “wallpaper”.